Lest you think this is a Junior League of pearls, white gloves, and sterling tea service – think again. Since 1931, the Junior League of St. Petersburg (JLSP ) has been a driving force in improving our community for families and especially children. Members of the Junior League are accomplished collaborators who build coalitions, identify community needs, and develop effective and responsive programs to serve those needs. For 85 years, members of the Junior League have focused their energies on school readiness and literacy, improved health care and nutrition, support for the arts, and advocacy for environmental responsibility through effective action and trained leadership. Collectively, the Junior League has donated more than $3 million and 7 million hours of volunteer support to programs and agencies in St. Petersburg and Pinellas County. So, it makes sense that when members of the League set out to create a year-long celebration honoring 85 years of service, it turned out to be less of a party in the traditional sense, and more of a challenge to its membership to increase volunteer hours in the community, and to raise funds nutrition. These are challenges the membership has embraced with enthusiasm. Kicking off the 85th anniversary celebration year was a gathering to say thanks to a multitude of community partners and sponsors, followed by a luncheon to honor the League’s history and projects, and ending the year with the Follies – An Anniversary To Remember, a stage show created, produced, and performed by members of the Junior League – because with every anniversary there must be a lot of fun! Junior Leagues have traditionally produced Follies using a cumbersome model that required hiring a professional director, building scenery, and hours of rehearsal. This year, the League has opted to create a new, more flexible model, where production is in the hands of the membership and includes an invitation to other community organizations to add their talents as part of the Follies – and part of the fun. An Anniversary To Remember will be presented at the Palladium on Friday, April 22, at 7pm. Proceeds from the Follies will support future projects. The last time a Follies was presented by the Junior League of St. Petersburg, proceeds provided financial wherewithal to create Great Explorations, The Hands On! 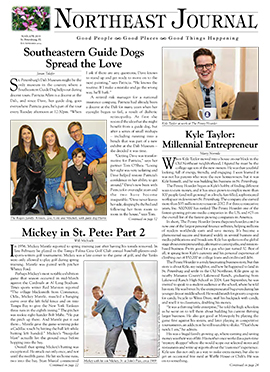 Museum, a project created in partnership with the St. Petersburg Times. Four of the Leagues most popular projects enjoy an unusual longevity and public appreciation. The League’s literacy focus embodies two long-standing programs: Library Puppets and Give A Book. Begun in 1942, the JLSP Puppet Troupe was formed to present puppet shows at local schools during the war years. After the war, the shows moved to the St. Petersburg Main Library. 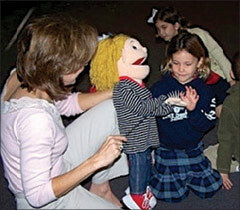 The Library Puppets continue to put on shows for school children, based on popular books, at no charge to the community. Library Puppets, currently in its 68th year of performances, has entertained over 180,000 children! Give A Book, Open A Door was launched as a short-term project. The result was a highly successful book drive which provided hundreds of books to children, and 10 short years later, in strategic partnerships with Pinellas Reading Council and others, Give A Book was reading to 350 children per month. Today, seven targeted community centers each month are exposed to literature by JLSP members. The program provides each student with his/her own book to take home in hopes of sparking an interest in reading. What started out as a four-month project has now spanned 20 years and given over 33,000 books, creating a literary impact on our community. Kids Create! gives kids an art and self expression experience under its big top tent. Staffed by League members, its traveling tent has moved from The Times Festival of Reading, to Mainsail Arts Festival, to the Urban League Crime Prevention Run, with other stops in between. The finest art in St. Petersburg adorns refrigerators across the community and becomes the most treasured grandparent gifts, created by the littlest artists at Kids Create! The Back-to-School Care Fair addresses the importance of school readiness and health care. For the past 20 years, members of the League have annually presented Care Fair to provide families access to a variety of services they need at one place and at one time. In addition to health screenings and school physicals for the children, parents learn about resources in the community. The day’s activities include entertainment and “make it, take it” projects for the kids provided by Kids Create! At the completion of screenings and physicals, participating children are provided with free backpacks filled with donated school supplies. It is a labor intensive project which requires hours of pre-planning and plenty of physical exertion. But at the end of the day, having assisted so many school-ready families makes the work fulfilling and appreciated. Not to be outdone by the active membership, each year the new member class develops and carries out a project exclusive to their class and interests. 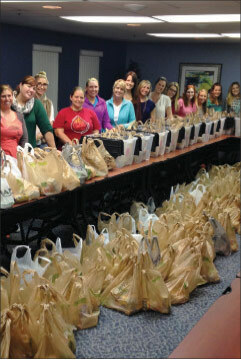 The 2014/2015 class partnered with The Kind Mouse Productions, a local non-profit organization, to create Mouse Nibbles, which are bags filled with food for children who might not otherwise have food for the weekend. The new members raised funds by hosting The Kind Mouse Fiesta, complete with food, fun, and games for the whole family. The class used their funds to shop for the food, and then met to sort, organize, and fill 300 bags, which the Mouse Nibbles program distributed to children in Pinellas County via schools. The Junior League of St. Petersburg empowers women through leadership training and development to take action in their communities and reaches out to women of all races, religions and national origins who demonstrate an interest in and commitment to volunteerism. 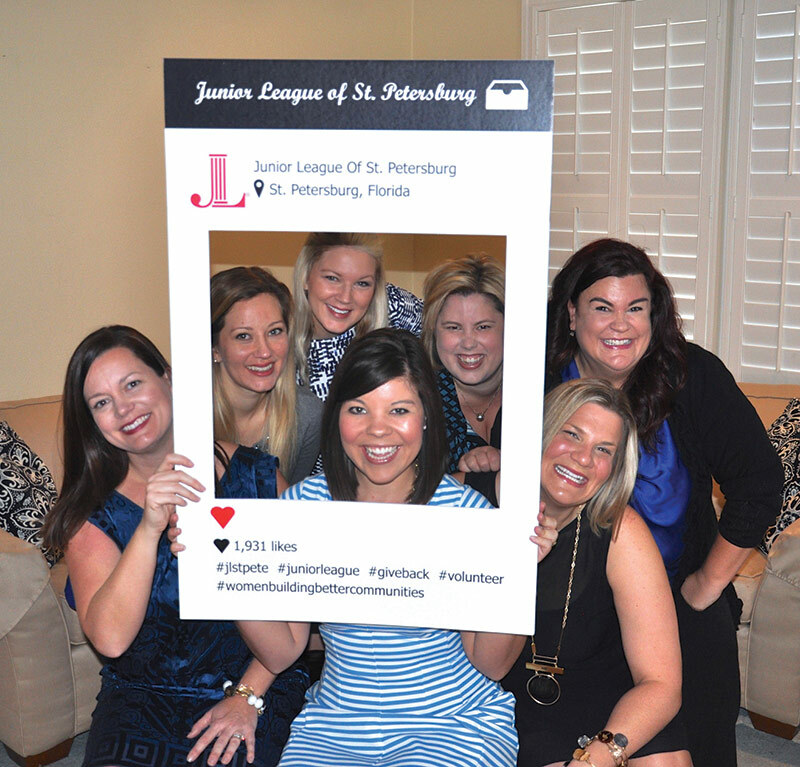 The Junior League of St. Petersburg is a member of the Association of Junior Leagues International (AJLI) which is made up of 293 Junior Leagues in four countries. 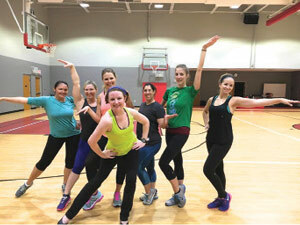 AJLI has evolved into one of the oldest, largest, and most effective women’s volunteer organizations in the world, encompassing 155,000 women in 293 Leagues in four countries. Over the course of 85 years of service, the Junior League of St. Petersburg has been privileged to create projects and provide support – both monetary and volunteer – in collaboration with some of the community’s most notable organizations, including Juvenile Welfare Board, All Children’s Hospital, Bayfront Center Foundation, Florida Orchestra, Pinellas County Youth Symphony, Museum of Fine Arts, The Palladium, American Stage, The Arts Center ( now called the Morean Arts Center ), Mainsail Arts Festival, Pinellas County Education Foundation, Pinellas County School Board, WEDU Educational TV, the Science Center, University of South Florida’s Oceanography Camp for Girls, Christmas Toy Shop, Ronald McDonald House, CASA, YWCA Virginia Lazzara Emergency Shelter for homeless families, Family Visitation House, St. Petersburg Free Clinic, and many, many others. The Junior League thanks all who have collaborated and conspired with us to make our community a great place for families and children. And while we have loved the last 85 years, we are ready to stand on the firm foundation we have built for the next 85 years. Now that’s a reason to celebrate! Tickets for the Follies are available by contacting the Junior League at 727-895-5018. VIP tickets are $50 and include preferred seating and a sway bag. General admission tickets are $22 for adults and $10 for children ages 2 to 12. The Junior League of St. Petersburg is an organization of women committed to promoting volunteerism, developing the potential of women and improving the community through the effective action and leadership of trained volunteers. Its purpose is exclusively educational and charitable. The Junior League is currently welcoming women interested in joining the next New Member class. 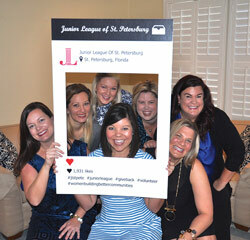 Please direct inquiries to the Junior League, Phone: 727.895.5018 or Email: hq@JLStPete.org.